You can feel the crisp chill in the air here on the East Coast of Canada. As I put on my mittens, you can almost hear the jingle bells in the distance. Honestly, it makes me a little bit giddy inside. I truly feel the magic every single year. Like every year, I vow to get organized early. Typically one of the first items on my agenda is to get our advent calendars ready. The tradition in our family is to select a wrapped holiday book every evening as well as a Lego Advent calendar for each child in the mornings. However, this year my kids are now seven and five. It’s a great age to begin some Random Acts of Kindness. 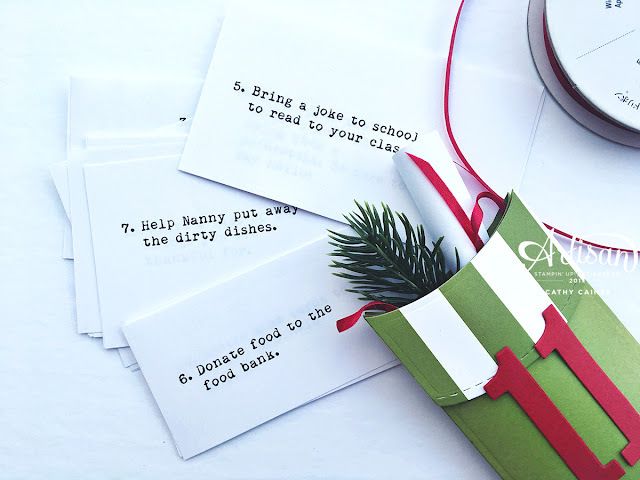 This Holiday List works the same way as a typical countdown to Christmas where my children will select a note each day. The Trim Your Stocking Thinlets Dies (144682) is a perfect product to hold the twenty-four pieces of rolled up paper containing the Random Act of Kindness. 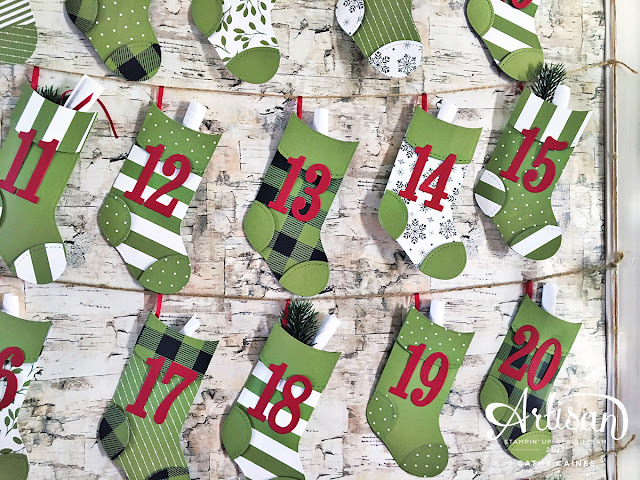 To begin this project, I cut out 25 stockings using the Merry Little Christmas Designer Series Paper (144621) and the Merry Little Christmas 12x12 cardstock pack (144622). 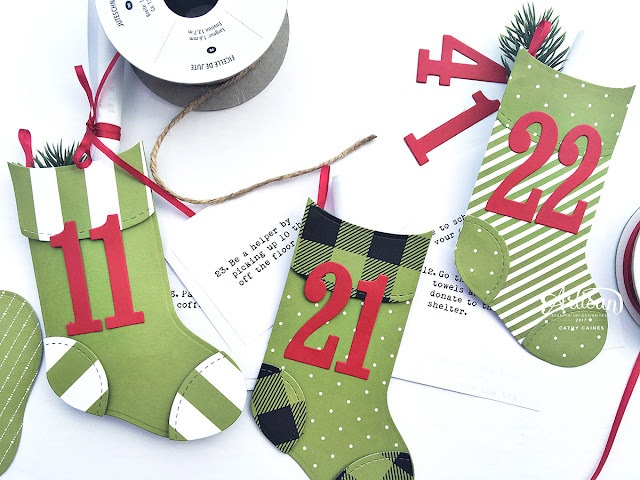 Carefully I pieced each holiday stocking together and placed a number made out of Real Red Cardstock (102482) and the Large Numbers Framelits (140622). Finally, I attached each stock with Real Red 1/8” Solid Ribbon (144631) and hung it on a large decorative frame using the Jute Twine (144625). 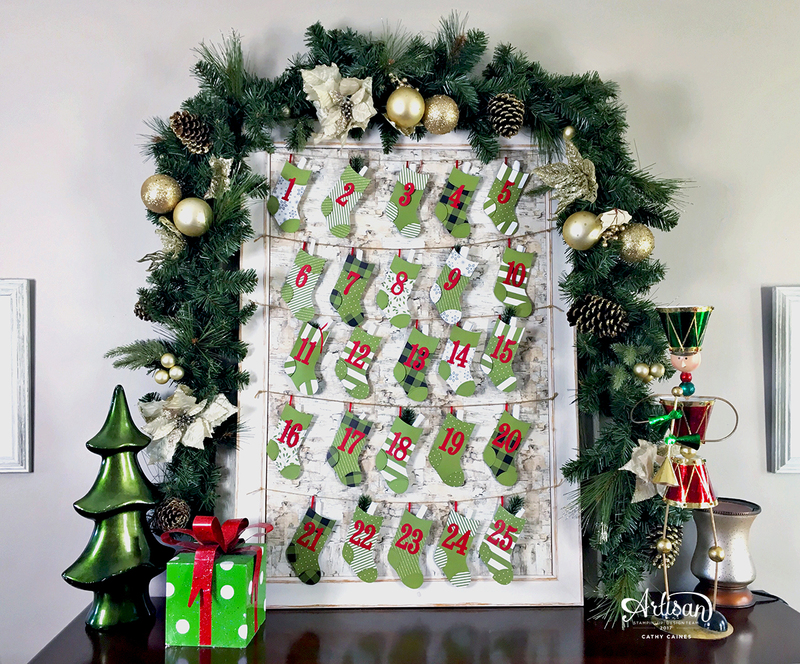 If you don’t have a large frame, you could use a three foot Christmas Tree to hang these stockings quite easily. The Trim Your Stocking Thinlets Dies (144682) also comes with a pillow box shaped die, which fits a gift card perfectly. It allowed me to have a pocket on each holiday stocking where I could place a rolled up Random Act of Kindness. Since my children are young, I selected some Random Acts of Kindness that did not take a great deal of time and would not be a financial burden. While I researched online for some ideas, it was easy to select twenty-four acts. I encourage you to tailor your own family’s Random Acts of Kindness list to what best works for you. 1. Send a card to a stranger such as a service man or woman overseas. 2. Donate new toys to the Happy Tree. 3. “Sock” a friend by putting a treat in a holiday stocking on someone’s doorknob with a special note. 4. Make 5 sticky note messages and place them on a mirror or a door. A drawing or a note like “you are beautiful” would be perfect. 5. Bring a joke to school to read to your class. 6. Donate food to the food bank. 7. Help Nanny put away the dirty dishes. 8. Draw a picture for your teachers along with a treat. 9. Shovel for a neighbour or clear off their cars before they wake up. 10. Donate 10 books you no longer need. 11. Help clean the neighbourhood on a walk. Be sure to wear your gloves and bring a garbage bag. 12. Go through our old towels and blankets to donate to the animal shelter. 13. Drop by to the senior’s home and bring them a poinsettia. Be sure to say hello! 14. Donate some cards to Ronald McDonald House. 15. Write a list of 5 things you are thankful for. 16. Pay for someone’s coffee. 17. Donate some money to a charity. 18. Leave candy canes on someone’s windshield. 19. Put a treat in the mailbox for the Post Man. 20. Call both your Grandmas just to say Hello. 21. Bring coloring books to the doctor’s waiting room and the gymnastics viewing room. 23. Be a helper by picking up 10 things off the floor each. 24. Give 5 people a compliment. Or more! I am wishing you all the best in your holiday preparations! I like your post.I am really enjoyed your blog post.Great Post. custom essay writing service This is really a fascinating blog, lots of stuff that I can Get into. One thing I just want to say is that your Blog is so perfect!